In 1983 the U.S. Congress passed a bill by a veto-proof majority, subsequently signed into law by President Reagan, establishing Martin Luther King Day as an American federal holiday. It’s being observed here today in the U.S., though one wonders whether such a law would have been passed by the current Congress or signed by the current President, what with all the talk about shitholes and such. Here in our own metallic shithole we’re conducting our own kind of observance, the kind that doesn’t depend on Acts of Congress or presidential largesse, but only on the continuing brain-blasting creativity of metal musicians, which seems never-ending. The torrent of new music since shortly after New Year’s Day has been kind of staggering. I may have to try to do one of these round-ups every day this week in an effort (one doomed to failure) to keep up. My colleague Andy called Venom Prison’s debut album Animus “nothing less than a neck-wrecking explosion of audio ultra-violence that fans of Dying Fetus, Cryptopsy, and Cattle Decapitation should already be salivating over”. Roughly 18 months after that all-killer, no-filler advent, Prosthetic Records will reissue the album on February 23rd. 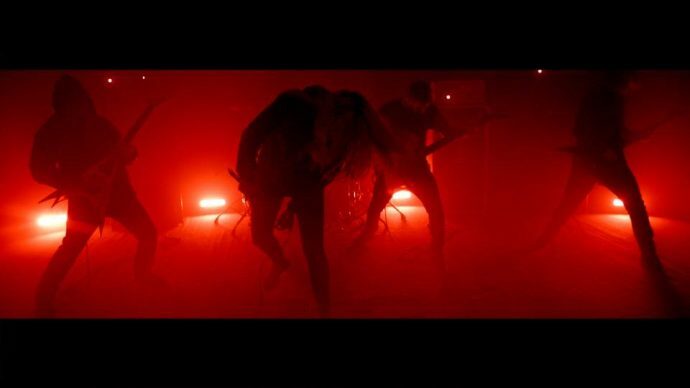 To pave the way, the band released a new video late last week (via Revolver mag) for a track off the album called “Immanetize Eschaton“. 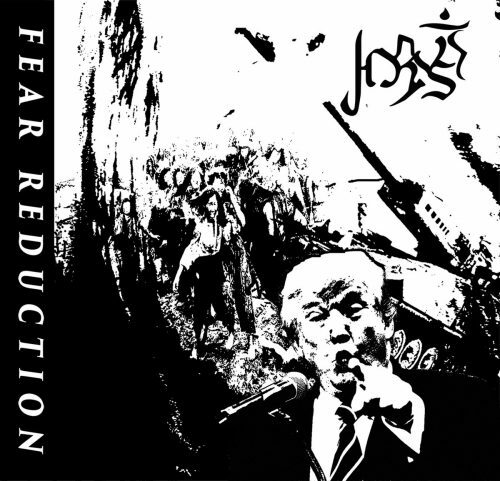 As described by the band’s lyricist/vocalist Larissa Stupar, “The concept of the video and the song is, basically, fighting the weakness within your head that wants you to stop living”. It’s a creepy and convulsive piece of music — a moaning, groaning, shrieking, slaughtering, soul-shriveling horror, something that could pass for the coronation anthem of the Antichrist. Or at least that was my reaction when hearing the song, regardless of what might have been intended. The dead red video (which could pose a threat to epileptics) is capable of raising goosebumps on your arms, too. Hail Mollusca! The slug-worshipping Slugdge are returning with a new album! And so, please do dive into “Putrid Fairytale“, the first single from the new Slugdge album, Esoteric Malacology, which will be released on March 2nd. The Great Molusca would surely be pleased by this electrifying prog/death head-spinner, even though it flies at a bazillion times the pace of your average slug and is more sharply angular and bone-jolting than soft and slimy. Because, after all, it makes reference to the branch of invertebrate zoology that deals with the study of Mollusca. In all seriousness, this track is the kind that lights off fireworks behind your eyes… and then soars at the end. The Welsh black metal band Agrona seems to have the population of a small army, and they strike with the force of one as well. Their debut album Realm of The Fallen will be released later this year on a date-to-be-announced by UKEM Records. We received the press release containing this announcement two days ago, and it included a link to the next song in this collection, which appears to be the first single from the album. “Apotheosis” is breathtakingly explosive, filled to overflowing with torrential energy, but the keyboard layers in the song also give it a vast and panoramic quality. It’s as fiery and frenzied as a gale-driven fire incinerating swaths of crackling forest… and even when the holocaustal firestorm abates, it still maintains an iron grip on your neck. Speaking of your neck, loosen the muscles in there, because the song is also a convulsive headbanger. UKEM tell us that In the coming weeks and months they will be revealing the full track-listing, cover art for Realm of The Fallen, and a brand new music video. Having heard “Apotheosis“, I’ll now be watching for all that. The three-man Singaporean sludge band hrvst (“harvest”, for those not as prejudiced against vowels) released a new single over the weekend. “Fear Reduction” is its name. I received a Bandcamp alert about the track because I happily bought their very fine 2017 EP Kingdom (reviewed here). I’m buying this song, too. As was demonstrated on Kingdom, this new song confirms that hrvst have a knack for creating music that, while bruising and ineffably bleak, is also mesmerizing… and head-nodding… and very easy to get lost in. They create a granite-heavy, disturbing trip in “Fear Reduction“, one that will do nothing to reduce your fears, but may make you forget them (along with everything else in your head) for six-and-a-half minutes. 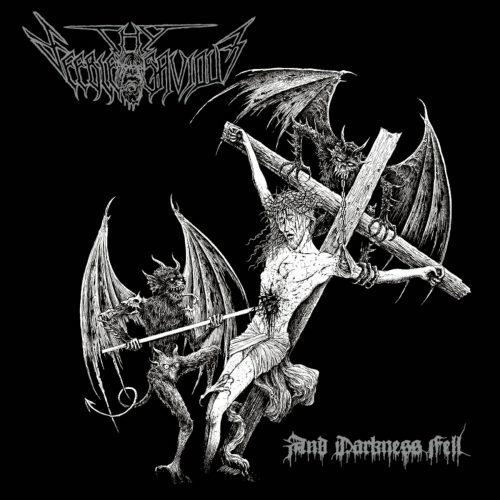 A Bandcamp alert on Saturday was also what led me to discover the next song in this round-up, although it was followed by a Hells Headbangers press release that recounted the history of Texas-based Thy Feeble Savior and their sequence of short releases dating back to 2004. As at its inception, the band is a two-man war machine, but with founder Francisco Pulido now joined since 2015 by drummer Matt Heffner (Blaspherian, Morbosidad, Oath of Cruelty). The band’s debut album, And Darkness Fell, will be released by Hells Headbangers on March 23rd. The first single from the album, “Torture Stake“, is less than a minute and a half long, but it makes a big impact nonetheless. It’s a goddamned bone-splintering, gut-rupturing rampage, a grind-paced maelstrom of black- and death-metal ingredients that makes you feel like ramming your head straight through a brick wall. Or maybe I should just speak for myself. To close this assemblage of audio head-wreckers I’m recommending an off-the-wall album named Notte di guai (“night of trouble”, according to Google translate) by a trio from Napoli, Italy, who call themselves Totenwagen. 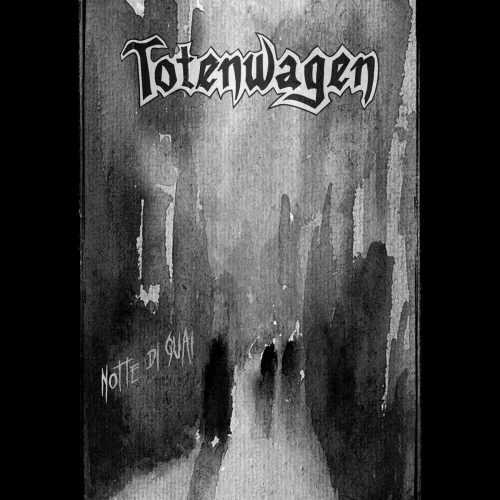 Interestingly, Totenwagen have no guitarist, relying instead on bass, drums, and keyboards, in addition to voices. There’s a heavy dose of punk in the music, and a heavy dose of raw, ravaging metal as well (plus other stylistic ingredients, including garage rock and death rock). You’ll figure out from the first track that Totenwagen don’t stay in the same gear for long at a time, and you’ll also figure out that they do just fine without a guitarist — the bassist is damn nimble, the drummer knows his business, and the keyboardist coaxes some very weird sounds out of his instrument during that track, with an even larger array of sounds emerging from the keyboard the deeper you go into this compact album. The way in which Totenwagen mix their influences is quite creative (and unpredictable), and the songs have individual character. I thoroughly enjoyed this ride, which at times took me far more decades back into my own past as a music fan than I want to admit. Venom Prison, Slugdge & Agrona made (the start of) my day! Good! Hope the rest of it went well too. Slugdge dropped annual crushers three years running and then took, what, two and half years off? Buncha lazy bums. Great! Glad to see another positive response besides my own.